"You cannot separate the musicality or the skills or how we play better from all the experiences that we've had." 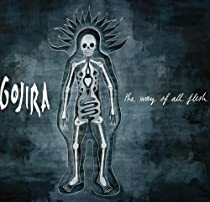 After a decade of partly self-imposed obscurity in their native France, Gojira burst on the international metal scene in a big way with 2006's brilliant From Mars To Sirius. The quartet's first international release, and third album overall, earned raves and caught the attention of scores of metal fans starving for something that wasn't just more of the same old thing. And Gojira's trippy, heaving bombast was anything but more of the same. Part death metal brutality, part math metal dexterity and part prog-rock whimsy and grandiosity, all the while boasting an ecological awareness and hippie-like spirituality that defied the typical belligerence and scorn, it was in a class all by itself. Seriously, how many other metal bands out there are singing about flying whales, outer space, dragons and global warming? The quartet - guitarist/vocals Joe Duplantier, his brother, drummer Mario Duplantier, guitarist Christian Andreu and bassist Jean Michel Labadie - follow it up in fine style with The Way Of All Flesh, out now on Prosthetic Records. Here the focus is on life on Earth - well, actually, it has more to do about death - and the fate of humanity. Pretty heady stuff, delivered in monstrously heavy fashion by a band that seemingly knows no stylistic boundaries. On the phone from the band's hometown of Bayonne, France, Joe Duplantier talked about how Gojira creates its sonic magic, the band's musical evolution, being a part of the long-awaited reunion of ex-Sepultura brothers Max and Iggor Cavalera and how Metallica got him through his awkward teenage years as a metal fan growing up in the French countryside. KNAC.COM: So are you at home right now or calling from the road? DUPLANTIER: We are home right now for two weeks, and then we go out on tour for two years (laughs). So I'm just relaxing and we have a few rehearsals, but basically we are staying with our girlfriends and families and loved ones before we leave. KNAC.COM: That's about how long you were out last time, right? So you must be used to the routine? DUPLANTIER: Yes, exactly. We learned what it was exactly on the last album. So I'm not scared anymore (laughs). KNAC.COM: Were you able to do any shows over the summer or play some of the European festivals, or were your recording the whole time? DUPLANTIER: We had a lot of proposals to do festivals and things like that, but we were really working on the new album. We were doing the mixing in July, and after we had to take care of the artwork and design, and the promotion and stuff. So no shows, except one, with Metallica in France. We just could not say no to that one. It took us like two weeks to rehearse and check the gear to make sure it was OK, because we hadn't played in like 18 months. And it was a great, great show. It was in the north of France, north of Paris, it was the only French gig for Metallica on the tour and we are big, big Metallica fans. It's because of Metallica that we are a band and they are our biggest influence, so it was just impossible to miss that show. KNAC.COM: Since everyone else seems to be chiming in on the new Metallica album, have you heard it and what did you think about it? DUPLANTIER: Actually, I didn't hear it yet because I was doing promotion in Paris for four days, so I was not available to listen to music and stuff. But I'm really looking forward to hearing this album. To me, Metallica changed after "the black album" in a way that I really respect. They have their logical evolution. But for me, the Metallica I like is the first part, between Kill Em All and "the black album." I'm not expecting anything from them. I just want to thank them for what they did for the metal community all over the world. I would say they even saved my life when I was in high school and I felt from another planet, felt really on my own. I was into Sepultura and Iron Maiden, but Metallica to me was really like a life-saver. I could walk to high school with Metallica on my Walkman and not feel so alone, so alien. I knew there were other people who felt the same way I did, that I could relate to. And that was very inspiring to me when I started playing music myself. KNAC.COM: I want to return to that in a minute, but first let's go back to this summer. Because you were recording, you couldn't do the tour with Cavalera Conspiracy either, which had to have been tough? DUPLANTIER: Yeah, but Gojira is my priority, I give everything to that. It's my life. I don't like to say that because I'm a human being, I'm not just a member of the band, but Gojira I give all my time for that, I did a lot of compromise for that. We are a band for 12 years with my brother and my bandmates, who are now like brothers to me. It is really my #1 priority. When I ended up being the bass player for Cavalera Conspiracy, of course it was an amazing experience and I was so happy to meet Max and Iggor. But I told them "I can be part of this album, but I won't be able to play shows after that," so they knew right away that I was doing the band, but I had Gojira first. So they were not surprised when they asked me again to do the world tour and I said "no, I'm in the studio and we have to release an album." KNAC.COM: At least you were able to be part of the Cavalera brothers' reunion, be part of history, as it were. DUPLANTIER: It was rewarding, it was fulfilling. I never thought I could one day have a band with these guys. Like I said, Metallica was important, but Sepultura was also very important to me. When they released Chaos A.D., I remember trying to play those songs with my crappy guitar. I was playing metal on a classical guitar in my bedroom and I was trying to play these songs, and it was mind-blowing. And when I had my first electric guitar someone lended to me I was amazed I was able to reproduce that kind of sound that I was listening to. It's a part of my musical structure, so when I first came into the studio in Los Angeles I was very nervous. I had my bass guitar with me and I was waiting for Max and he showed up and I was like, "Oh my god." And he took me in his arms right away, and was like, "Hey Joe, so nice to meet you. We're going to have fun and I'm really glad that you accepted being the band, it's gonna be great." And suddenly he became like a friend, a colleague, a bandmate. And so from a fan I became like an equal and it was very important to me as a human being. I remember this moment when we were playing for the first time and he asked me, "Well we should have a jam first before composing so we can feel the vibe for the band first, can you play some Sepultura stuff?" And I was like "yes, I can. Basically that's how I learned how to play, so yes." "OK, Joe tell us what do you want to play." "Well, 'Territory,' for example," and Iggor started to play the drum intro and the brothers were playing together for the first time in a studio for 11 years, so there was a lot of emotion, it was very intense. The families were there in the studio. I'll never forget that, it was really incredible experience. There was a very, very strong energy. The songs are a symbol of their brotherhood for years, and working together on the same level, and they put that aside for more than 10 years and then suddenly you play that, and it all comes back. The energy was incredible. KNAC.COM: To go back again to where your music came from after you were playing Sepultura songs on acoustic guitar, was there much a metal scene in France to draw from or were you, like you were saying, really alone in your world of metal? DUPLANTIER: Basically at that time at least, the early '90s, it was not that common to have a metal band, at least where I live. In Paris it was more common, but here in Bayonne, in the southwest of France, it's in the countryside, so there were not a lot of people. The positive thing for music here is we're not far from Spain and there are some bands on the border of Spain and France, the Basque country. There is a scene there of like rock and punk bands talking about being independent and stuff like that, so there is a certain energy coming from that culture. But I'm not really part of that culture, my father is French and my mother was born in the United States, she came to France when she was very young. When we started we were probably the only guys trying to play technical metal, like Metallica, Sepultura, Morbid Angel. We were trying to build something that was very unknown and new in that area. KNAC.COM: Has the metal scene grown much in France since then? DUPLANTIER: It has exploded in a few years. I don't know why it happened. France, we were the big losers of the Second World War, and the early '50s in France the national pride was destroyed and I think it's one of the reasons why we didn't have one French band shining in the world. We don't have this culture or tradition of international artists. The generation of our parents, I think, they still have this feeling of national shame. But it seems like there is an awakening in France now, a lot of bands are emerging from nowhere, from the vacuum of space (laughs). We have more and more bands coming from Paris, from Toulouse, from very small towns. There are some very talented musicians, so I think France is about to become a place with professional bands that will be making an impact, to be sure. KNAC.COM: What would you say has been the biggest factor Gojira's musical evolution? DUPLANTIER: You cannot separate the musicality or the skills or how we play better from all the experiences that we've had. I would say that it's playing these festivals, learning how to behave on these big stages, having more fans to deal with and also the faith that we have. We have a very strong faith in what we do, we're very, very positive. We made a choice to be positive in what we do and we choose to believe that it's possible to make it, even if we're French, even if we're from the countryside, even if we don't have a lot of support of a collective of people or a tradition of international bands. That pushed us all the time forward. And we are also very big perfectionists. When we listen to our albums, we analyze and try to see what we can do better next time. KNAC.COM: With the response to the last album, and all the progress you made because of it, were you more confident coming into this one? DUPLANTIER: At the same time, it's not easy to have so much expectation. It's a bit of pressure, but I won't complain. It's better to have a lot of expectation than a lot of nothing. Of course that is great. We were actually surprised that so many people were saying "From Mars To Sirius is our favorite album." There were so many positive messages and a lot of support from the people and so much enthusiasm. Because we are so critical toward to our music and we analyze it so much, sometimes we don't understand why people are so positive about it. But it's a fact that they are, so we just accept it, say OK, go on and keep on writing songs. Yeah, it brings confidence, so my answer is yes (laughs). KNAC.COM: Still, you guys can be a hard band for people to get into because your music is so far out in left field ? DUPLANTIER: I like this idea of music with mystery, things that you don't understand right away or you need several listenings to be able understand. We play the music that we want to hear, we like when there are keys in the music that you don't get right away. We try to be spontaneous. I think if you are spontaneous and don't judge yourself too much, crazy things can happen and original things can happen. But if you are worried and judge yourself too much and you try to be like other bands and use the same words and same images and same notes, nothing very original will show up. So I think it's important to be confident in what you do in general, and I would say that our point of view is that anyone can write a good song or can have a logical artistic world if there is honesty. So that's what we try to put in our music, being honest as much as possible. I know that some of our ideas are pretty crazy, like singing about flying whales and things like that, but it means something. I don't know what, exactly (laughs). KNAC.COM: By the same token, I'd think that once people feel like they've got their head around your music, they're hooked? DUPLANTIER: It becomes an institution. It's funny, something totally irrelevant or weird or coming from we don't know where sounds so surprising at first and then it becomes like a hymn or something finally, because you believe in it and you bring it on tour and you play it and you print it on the record and it becomes a universe, and that's fascinating. I love that. I love that feeling of creating something out of just imagination and dream and faith and it becomes something real. KNAC.COM: Musically, the new album is less death metal and more progressive, is that what you intended at the outset? DUPLANTIER: Basically, that's what happened. We get in the practice room and we talk with each other and we have ideas or feelings and we start playing and just try to catch this thing that's in the air and let it go, let it flow. We try to stay spontaneous. We thought, "oh that would be cool if the next album, The Way Of All Flesh, would be short songs, more easy to understand." Because we are so epic and the songs are so long, when we go on tour we like to have short songs to play because it's more energetic. So we decide that, and the day after we compose like a seven-minute long song, so it's impossible for us to decide what we're going to do, it just happens. We're victims of that. KNAC.COM: How does the band put the material together? Does it start with you and your brother, or is it usually the whole band kicking stuff around? DUPLANTIER: It depends on what album. On this one it was just my brother and myself for probably 99 percent of the album. My brother and I have a strong connection, musically speaking. We don't need to talk too much to explain what we do, we just play and it happens and it's very easy for us to play together. It's a way to communicate, which I also found with the Cavalera brothers, it's something that brothers have. After a lot of touring for From Mars To Sirius we were just exhausted. We were very, very tired and needed some vacations. And Jean Michel and Christian, the two other guys, really needed a break. Mario and I, even if we were drained, it was not that hard to be the two of us in a room finding ideas, so we kept on going like that and finally we did the whole album like that. The other guys were not too far, they were listening to what we were doing and giving their advice and their opinions, it worked like that. On the other albums it was a bit like that too, but we would rehearse more, the four of us, and talk about the songs. But for this album we just did not have the strength to talk. So for this album it was basically just my brother and I mediating the songs. KNAC.COM: You mentioned the Cavaleras, who have that same guitarist/drummer arrangement as brothers. Does that help from a creative standpoint, that dynamic, as opposed if you were both guitar players or something? DUPLANTIER: On top of that I'm also the singer, so it's true that we have the structure of all songs, so it's possible for us as brothers to build the whole albums. I also play bass. The two other guys, it's not like we're not kicking them out. They needed to rest and stay aside from this album and they knew anyway, "OK, the brothers, they're doing the stuff," and it's fine with them. KNAC.COM: You've described the new album as "a requiem for our planet." Could you explain what you mean by that? DUPLANTIER: On this album, I would say I'm trying to be optimistic and talk about my imagination and my dreams and the things that are very positive in the songs. But because we toured a lot and saw a lot of things, we are more realistic about the way we are destroying the planet and ourselves. That's why I'm talking about a requiem and that's why the album is called The Way Of All Flesh, because it seems like humanity goes to chaos, like our lives are going to the last line, which is death. But at the same time I believe in life after death (laughs). So I have a lot of ideas and things, but I believe the soul is immortal and the soul will remain after we die. So I ask a lot of questions with the music. I feel this deeply, even if there is death, even if there is chaos, I still believe there is hope. So I would say that on this album is realistic, but at the same time optimistic. It seems paradoxical, but not to me. KNAC.COM: Despite your professed optimism, it still sounds like you think we're doomed? DUPLANTIER: I would say that I consider myself a naive person, I like to keep my child's way of seeing the world, and most of the time I'm very optimistic about the future, because I believe in humanity and I believe that we have the strength to overcome this crazy situation that we have on Earth: people basically killing each other, people draining the oceans, killing endangered species and the very old trees that we need to breathe. We know that but we still go on destroying the planet. At the same time, I feel this capacity of destroying things inside of me too. I'm a part of this humanity and sometimes I'm jealous or sometimes I'm just stupid or bad or angry toward other people or I don't have compassion. I understand that that is reflecting what is happening with humanity, but I also feel deeply in me some good things, like I like to have other people happy, I like to help other people, I like to make things good for others, for the planet and for myself. I like to think. So I'm pretty confident because of that, because I feel the dark side and the bright side inside of me, so I'm pretty sure that it's the same thing for everybody, so that's why I chose to be confident about the future. KNAC.COM: Do people seem to understand where you're coming from, or do they just seem to be confused by it all? Or do they even care? And do you care if they care? DUPLANTIER: Now I'm confused (laughs). I would say that most of the time they don't talk about it, or don't go too far into a discussion about it. But at the same time, they understand it. Sometimes people tell me "hey it's very complicated and very crazy, you must be very frustrated having no one understanding it." And I'm like, "not only do the fans understand it, but also the press and my bandmates, everybody is understanding something out of it. And anyway, it's just poetry. It's music. It's art. So everyone can understand their own thing through the lyrics. I'm not doing politics, I'm doing art. And people get it. Even if they see us live, and I'm screaming like a pig or something (laughs), they think the lyrics are interesting and they still can get something that is behind all this.